The Mediterranean looks set to remain true to tradition, and the first leg of the Barcelona World Race should be light and very tactical. After a generally quite slow 24 hours for the fleet, with no boat averaging anything faster than 12kts, this morning it is the two must southetly boats - Renault Captur and Spirit of Hungary - which are quickest this Tuesday morning. Leading the way back towards the Mediterranean, at the latitude of the Canaries today, Cheminées Poujoulat have slightly more settled trade winds blowing around 18kts from the NE, meaning Bernard Stamm and Jean Le Cam are sailing at a regular upwind 12kts or thereabouts. They will likely make their tack for the Med tonight after midnight. According to the routing this morning they would then reach Gibraltar around 01:00hrs on the morning of the 21st, but the Med promises slow upwind conditions to the finish. 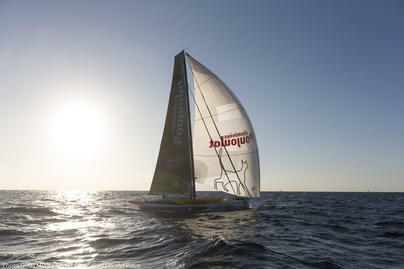 On Day 81 of racing, Cheminées Poujoulat is back in the Mediterranean. 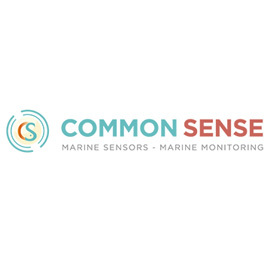 At 8.30 (UTC) Bernard Stamm and Jean Le Cam crossed the longitude of the Straits of Gibraltar which mark the border between the Atlantic Ocean and the Mediterranean. 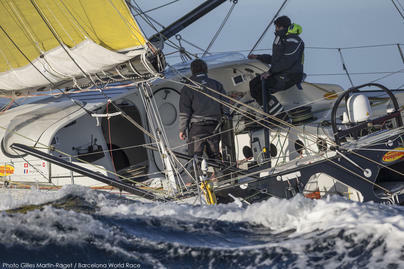 Less than 400 miles to the finish the Mediterranean is living up to is reputation for capricious spring winds, Bernard Stamm and Jean Le Cam spending a fitful, frustrating in the Straits and of Gibraltar, now in the west of the Alboran Sea. 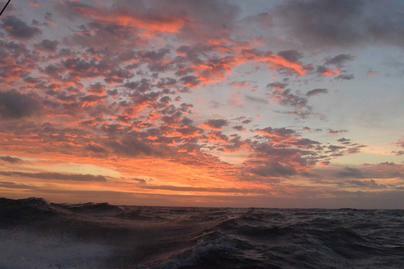 Thay have had difficult, shifting light E'ly winds and so it has been upwind. This morning their winds have picked up slightly and backed, so they will be in 10kts from the NNE, making about 9.5kts. 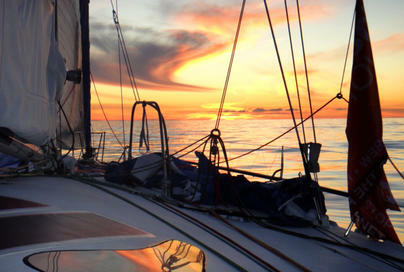 Less than 400 miles from the finish line now, Cheminées Poujoulat are passed Cabo de Gata, east of Almeria, and are starting the final ascent of the Mediterannean out of the Alboran sea to Barcelona. Bernard Stamm and Jean Le Cam are forecast to finish some time between 1000hrs and midday on Wednesday, but still have some complicated final transitions standing between them and a well earned victory, which may make that ETA ambitious. Cheminees Poujoulat did a bit better than expected with respect to progress yesterday. However they are sailing in lighter breeze and will have slower progress today as they sail into a transition zone between W/SW breeze over the Alboran Sea and a developing N/NE wind over the northwestern Med and along the East coast of Spain. 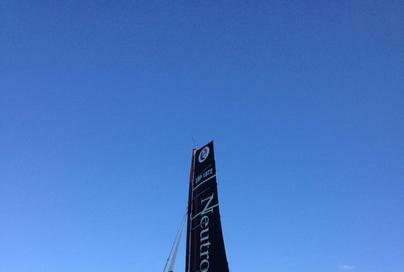 Neutrogena and GAES Centros Auditivos are sailing upwind angles toward the Canary Islands. The winds have been moderate, but expected to increase and back more NNE, hopefully allowing them to sail in clearer air north of the islands. 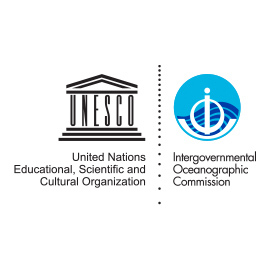 We Are Water and One Planet, One Ocean & Pharmaton have finally escaped the doldrums. 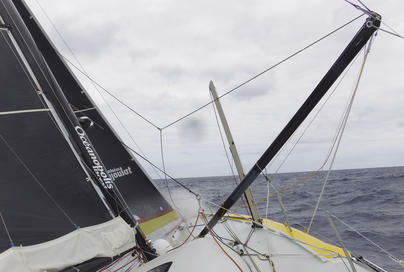 One Planet, One Ocean & Pharmaton was first out in their more easterly position, and is now in building NNE trade winds. Renault Captur is continuing to sail up the Brazil coast in relatively light winds. 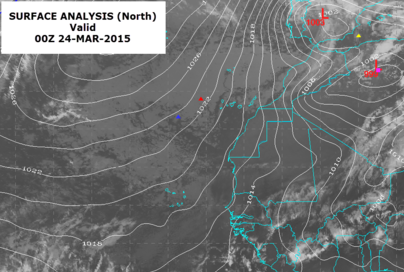 The South Atlantic trade winds are forecast to improve with time and as they get further north off the coast. Spirit of Hungary is reaching NE through some SE'ly trades, but these may diminish somewhat as they reach a transition zone along 28ºS. Navigation au près pour Cheminées Poujoulat pour ses derniers milles. 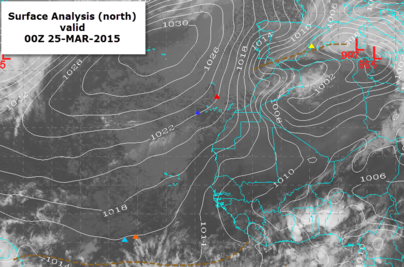 Les basses pressions sur le nord de la Méditerranée se combinent avec les hautes pressions sur l'Atlantique pour géénerer un flux de nord dominant le long d ela côte est d el'Espagne et sur les Baléares. .Les hautes pressions maintiennent un flux modéré de N-NE sur la zone d'évolution de Neutrogena et GAES centros Auditivos. Le premier a réussi à mettre du nord dans sa route et bénéficie de vents clairs jusqu'à Gibraltar. Ce sera plus compliqué pour GAES qui pourrait subir des vents plus variables perturbés par les reliefs des Canaries. One Planet, One Ocean & Pharmaton et We Are Water naviguent, route au nord-ouest dans des alizés de NNE. Ils devront mettre plus d'ouest dans leur route que leurs prédécesseurs pour éviter les alizés mollissants dans leur nord. Renault Captur a finalement trouvé des alizés d'est forcissants. Ils progressent rapidement vers le nord jusqu'au Pot au noir. Spirit of Hungary est dans un vent portant modéré, mais continuent de se rapprocher de vents plus faibles. 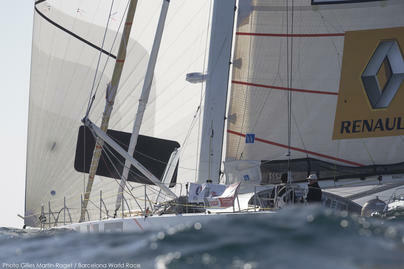 Bernard Stamm (SUI) and Jean Le Cam (FRA) are within 15 miles and about 90 minutes of sailing time of winning the third edition of the Barcelona World Race. 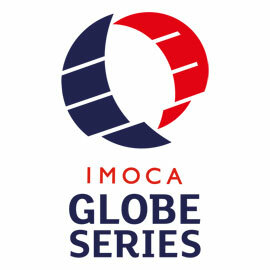 The Cheminées Poujoulat co-skippers were still making 8-14kts of boat speed towards the finish line off Barcelona's W-Hotel. Second place Neutrogena has entered the Mediterranean and transitions to dealing with lighter, more changeable winds and considering the land and seas breezes along the coast of Spain. Fortunately, for the next 24 hours, light to moderate following SW/W winds are expected to carry them toward the finish. 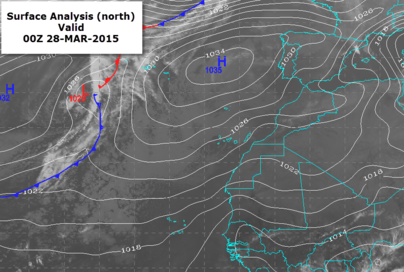 Third place GAES Centros Auditivos is still making relatively slow progress north/northeast as they fight moderate N/NE winds off the African coast and into the Gulf of Cadiz. 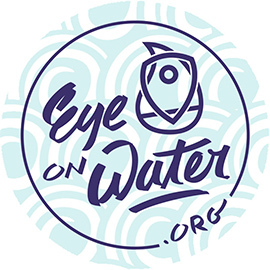 One Planet, One Ocean & Pharmaton and We Are Water continue to experience veering trade winds as they sail north. This is allowing both of them, but especially We Are Water to hedge back east from their far westerly position. Renault Captur got trapped in the doldrums yesterday, but made enough progress north so that they should break free into the NNE/NE trade winds at the Equator today. Spirit of Hungary has reached the transition to the SE trades. There is a wide area of light wind for them to negotiate before reaching more consistent breezes north of 15S. 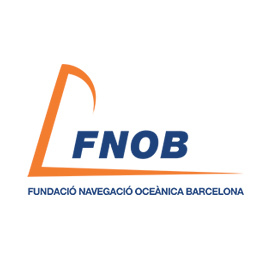 Neutrogena are playing the changes between the light night breeze and the day's winds well but early this morning they are slowed back to just 4.5kts and are close to the Spanish coast at Murcia having gybed close to Cartagena last night. Guillermo Altadill and José Munoz will continue to sail light downwind breezes through today, passing close to Ibiza tonight, probably around 2200hrs then should hav good W'ly winds to Barcelona where they are due to finish around 1430hrs Monday afternoon.